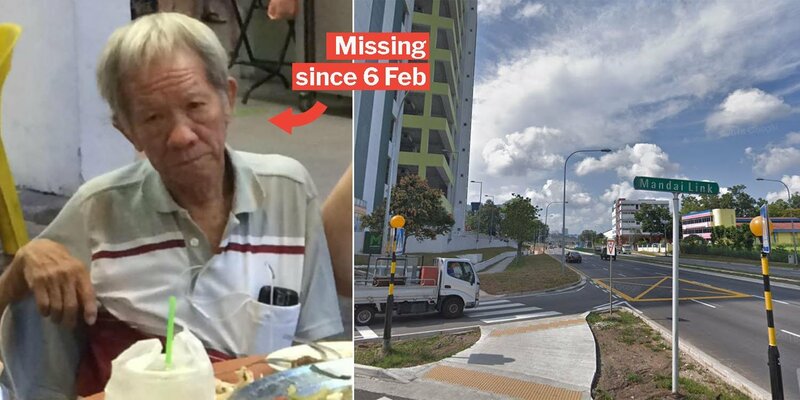 Netizens are urgently trying to reunite a missing daughter with her elderly father. 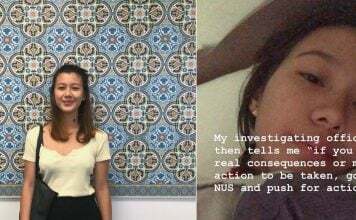 Ms Sharon Goh posted a Facebook plea in the wee hours of Monday (11 Feb), which has garnered 5.4k shares at the time of writing. We implore everyone to help look out for our missing father. His name is Chai Ah Ming, and he’s 72 years old. On 6 Feb, at 10.30pm in the evening, he left home and hasn’t returned since. He was wearing a dark blue and white-striped polo T-shirt with a collar. He was last seen at Mandai Link. The police are assisting with the investigations. If you do see my father, kindly contact Sharon at 9106 9912. Thank you. Ms Goh’s father left their home at around 10.30pm last Wednesday (6 Feb). He’s also clad in a dark blue collared T-shirt, with white stripes. The family has already made a police report. However, they’d like to appeal for the help of everyone in the vicinity to look out for the missing elderly man. 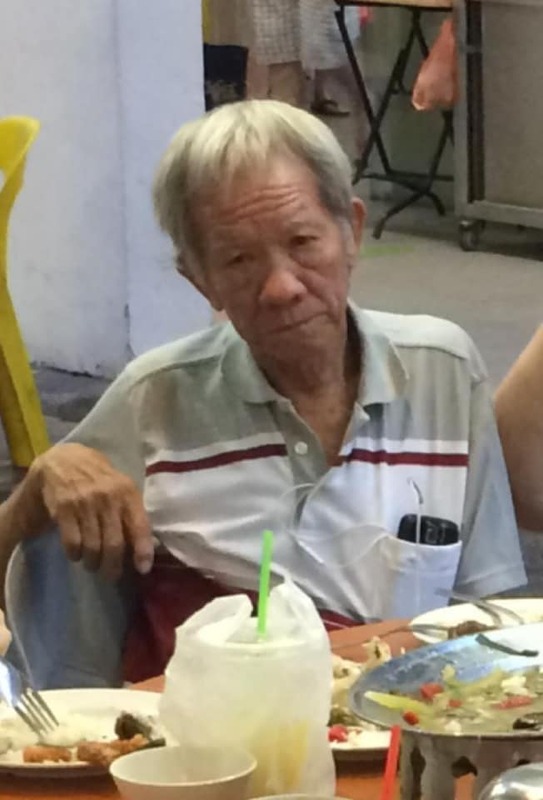 Mr Chai Ah Ming was last seen in the Mandai Link area. As of today (12 Feb), his whereabouts are still unknown, but a police report has been filed. There’s been a huge show of support from Singaporeans for Ms Goh’s post, especially in the comments section. Netizens have reached out to her with hopeful prayers that he will return safely, and be reunited with his family. Others expressed surprise that people can “actually go missing in Singapore”. 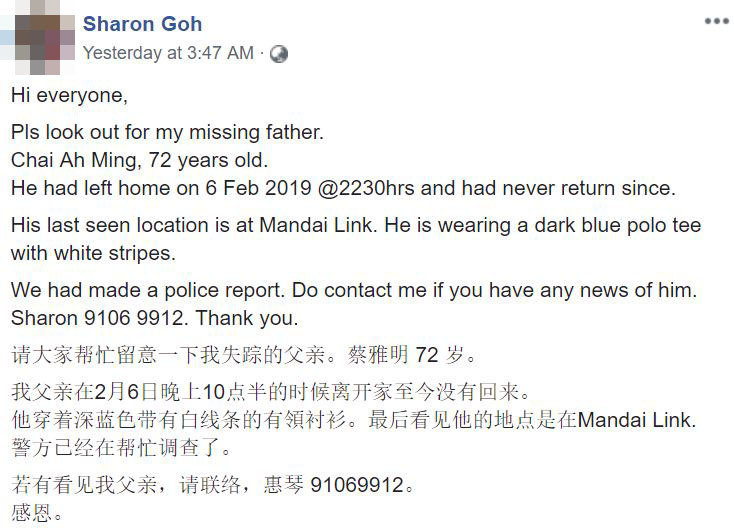 Ms Goh has replied that she’s grateful for the help her family has received, and that she will update the post if her father is found. Do contact Sharon at 9106 9912, via text, phone or Facebook messenger if you have any information regarding the case. Until then, we hope Mr Chai Ah Meng will return home safely into the arms of his loved ones soon. Featured image from Facebook and Google Maps.